April 22, 2012 November 20, 2014 NicolleLeave a Comment on Welcome! Bruno Latour once called ethnography ‘the art of wonderment’. He talked about a team of researchers who went for into the jungle to investigate the soil. Their discourse slowly transforms the empirical into theory, something verbal, something reflexive, something innovative. Latour is an outsider to their discussions but because he’s also a scientist that tags along, he can also amply observe their thought processes and how they slowly construct facts and culture. I’m Nicolle. Like Latour, I’m an ethnographer that sometimes steps into cultures partly as an insider (like Latour, who is himself a scientist researching scientist) that tries to describe contemporary fandom. I’ve been blogging for years on various sites and I even had an old WordPress account before that I shut down. For a while, I felt that Twitter and other sites covered my research, interests and life perfectly but lately, I started to doubt that. I missed words. I missed writing reviews. And most of all I missed a place of my own to upload what I had collected as a media scholar and ethnographer, and as an artist. So by now, it’s time for something new. I have been working on a PhD thesis for fan cultures for over two years now. I have field notes of fan conventions, science fiction events and fantasy fairs that are bursting out of the book. There’s case studies and interesting news that my theoretical chapters won’t cover either. I want to communicate more. About how things are going. About drafts, my little ponies, the world, the academic stuff that I wrote but also about what inspires me. Don’t be mistaken. This blog won’t be a super-academic blog and not a blog that communicates fan studies to outsiders (Henry Jenkins, for instance, already does this very well), not anymore, but it will be there to collect stuff that is vaguely linked to my work more than it will ever be a hobby blog or image blog. 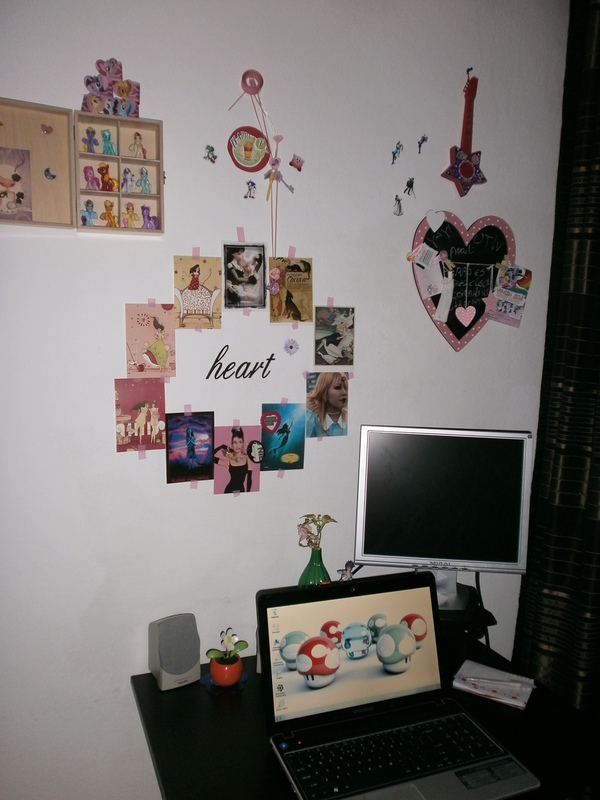 This is my work station at home. It has trinkets everywhere. Latour only took a map from his expedition to the rain forest but I try to make it actual. I put inspiring cards and items on my flow wall and every now and then, I change them a bit. I love, laugh, dress up, write, think, draw and listen. And I felt that making a blog, rather than just tweeting or waiting, was a good way to express that. I hope that this will speak to your imagination and will not only be a way to communicate my own sense of wonderment.